A Record of Fear was a commission for Contemporary Art in Historic Places, a partnership between the National Trust, English Heritage and Commissions East in which three artists were invited to create new work inspired by historic properties. Once a secret military testing site and now a nature reserve, Orford Ness temporarily played host to a series of audio and video works exploring aspects of broadcast and transmission. The viewing gallery of the Black Beacon building - used to develop an experimental navigation device - was the location for an audio work, which used manipulated sound recordings from the Ness. Visitors were invited to listen carefully to what is already there as well as what is generally inaudible to the human ear. An array of contact mics, hydrophones, ultrasonic recorders and regular microphones had been used to capture the subtle ambient sounds of the site. The Exmoor Choir were invited to perform madrigals in some of the remaining military buildings, once used for environmental testing of the atomic bomb. The human presence singing songs of love and an awareness of the passing of time provided a poignant counterpoint to the stark and disturbing interiors. A specially commissioned piece by Yannis Kyriakides entitled �U� provided a meditation on the passing of time. 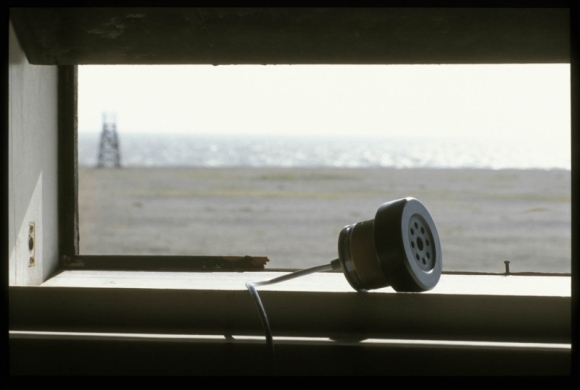 For one-day only, visitors were allowed to enter some normally inaccessible test laboratories that become locations for sound installations, including the sited recording of a working centrifuge at AWE Aldermaston which was formerly in use at AWRE Orfordness.